Students no longer choose a college based on academic factors alone. They also consider campus life and whether they can imagine themselves there for several years. Whether it’s a residential university or a community college, students are increasingly attracted to vibrant neighborhoods with car-free access to home, class, and leisure. That’s where campus retail comes in. At SGPA we have been seeing an increase in education clients who want to employ our four decades of commercial retail experience on their campus. To help them add diversified retail options that attract students while improving the bottom line, we rely on the three key design principles below—and so can you, whether you’re the architect or the retail manager. “Location, location, location”—we’ve all heard it before, and for good reason. Location is the most important factor in any commercial retail project, and it’s especially important on a college campus. As you evaluate your choices, keep in mind these five components of a good location: it must be visible, well traveled, convenient, accessible, and adjacent. Even if your school is constrained from growing around the edges, you can use this limitation to your advantage. Study the existing flow of students, faculty, and staff, and locate the store where they already spend time, rather than trying to draw their attention elsewhere. Don’t forget to pay attention to location within location. Carefully consider how deliveries and waste removal services interact with pedestrian and vehicular circulation. Orient seating areas so they face an appealing view, and so they’re visible to draw in passersby. Make sure to create pedestrian-friendly gateways and links to surrounding areas. Public places are changing and becoming that “third place” (other than home and work/class) where people, especially college students, spend increasing amounts of their time. On a campus where potential customers have so much competing for their attention, you can make retail attractive by combining it with active uses. Add food, leisure, entertainment, and study so that customers are drawn to visit your location regularly. These placemaking strategies create destinations where people want to spend time. You can use hospitality techniques to enhance the service and comfort in small yet important ways. Create seating areas that make visitors want to linger longer. 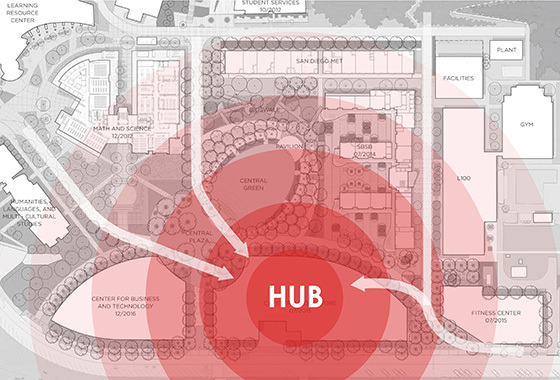 Create landscape connections and activity nodes that define public and private spaces. Think of your campus retail as a place rather than just a store. And don’t think just of the students, but also their families, campus faculty and staff, and visitors. The bottom line is, of course, the bottom line. So now it’s time to consider using creative revenue generators pioneered by malls and shopping centers. Place advertising on campus walls and signs, or even tabletops. Install kiosks throughout campus that draw in other traffic streams, rather than relying only on your main location. To provide the best service for customers, create a design that flexibly addresses needs by the hour, day, and season. For instance, your store can feature kiosks that change seasonally for book buyback or enrollment decision time. It can have stock that rotates throughout the day to offer a grab-and-go lunch at noon and a warm drink for study time at night. Interactive displays and monitors allow up-to-the-minute changes. Any campus project involves a large and diverse community of stakeholders: students, administration, faculty, staff, facilities team, and even alumni and neighbors. It’s critical for the project team to establish relationships and conversations with the entire campus community before the project begins. Get involved in planning and building committees, and be sure to support decisions with numbers. In the end, this community’s buy-in and insights will be invaluable to your project. Retail can be both challenging and exciting, and it’s a great fit for a college campus. To learn how SGPA can help you design successful retail and education projects, contact Keith Pittsford, principal architect, at infosd@sgpa.com.